If this blog has proved anything over the past few years, it’s that you don’t have to spend a huge amount of money to travel. The hubs and I are major fans of seeing new places. It’s one of our most favorite things to do in life. We even lived in the Caribbean for three years before we had our kiddos. 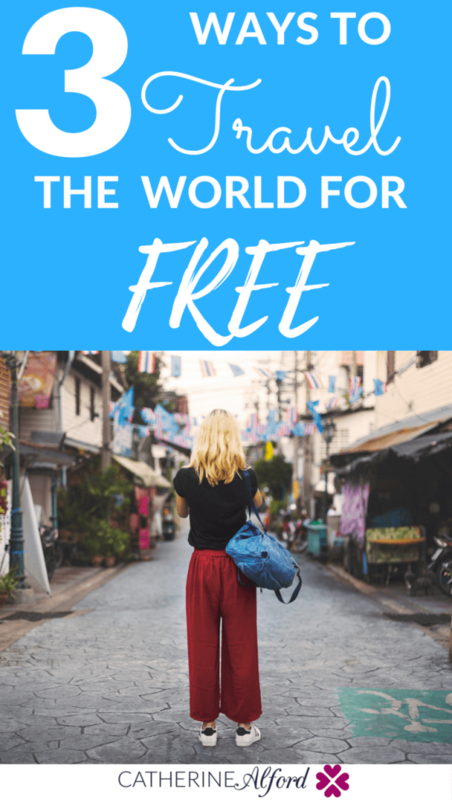 I’ve learned over time that you can travel the world for free (or at least get one big chunk of your vacation for free!) if you know what to do. Basically, if you are willing to try something different, you could get to see some of the world’s most beautiful beaches and coolest cities for a fraction of what some people pay. House swapping is becoming more popular, and I’ve actually had a few friends find success with this method. This is where you swap your property with someone else in another country or city. You obviously need to own a house to swap for a week or two, but that’s it. You save so much by not having to pay hotel costs when you are away, and most houses have Internet, TV, and a kitchen where you can make your own food. Of course, not everyone has a suitable property for house swapping, so it really depends on the city you live in, but if you do, be sure to use caution when choosing someone to live in your place! If you don’t want to house swap, we’ve had really good luck renting places on Airbnb, which isn’t free but you can still find great deals. We traveled to Europe for a month last year and stayed in Airbnb apartments the entire time. If you’re interested in trying out an Airbnb apartment for your next vacation, here is a $40 credit to get you started! Volunteering to go abroad and do charity work can be a good way to really make a difference and see new places. However, this sort of work often takes a long term commitment of a year or two. For example, if you join the peace corps, you’ll agree to a two year commitment. While you do get paid, it is only a small amount. However, you get to see parts of the world that others don’t! I’ll never forget meeting two girls at a local restaurant when I lived in the Caribbean. We had a great conversation, and I enjoyed talked to them. It turns out, they were European and were working on an absolutely stunning 150 foot yacht. They made a stop to our island to refuel and buy food. I ran into them while they were on a break enjoying a beer at a local restaurant. My interaction with them made a huge impression on me. Everyone on the island was talking about that specific yacht at the time because it was so massive, and these two girls who were the same age as I was were sailing the high seas on it. Sure, they were working, but they also got to explore my island Grenada while they were there and taking a break! I thought it was awesome. Ultimately, if you have a passion for traveling, you should never let money hold you back. There are many ways to travel for for cheap if you have a passion for it! I recommend checking out the book Travel the World on $50 a Day if you want some ideas. I recently read it, and it had some awesome tips in it! P.S. If you want to talk more about traveling, I’m co-hosting a twitter chat today at 12 EST. Follow AllianzTravelUS & me to participate using the hashtag #TravelHappy! Joining conferences or training workshops. I have had two free abroad trip just to attend these kinds of activities, but what they may ask of you is research or article/essay for you to have a chance to be accepted. It’s really worth it. These are all great ways to travel the world! I have definitely considered doing a community service trip to give back to the world as well as see new places! When it comes to house swapping, is it house swapping with friends and family, or is it through a website with randoms? Curious because I never heard about it before! The problem with house swapping is that you have to live in an interesting place. I don’t. But I have been considering moving just to house swap, there are a couple of websites I’ve checked where you can find “matches”. But actually home swapping is not exactly free. Some home-exchange sites are free; most aren’t. The majority of home-exchange programs charge users a membership fee to list and search for homes and get in contact with members.